The FreshWater portable gravity filter is a convenient way to enjoy freshly filtered water. Capable of producing up to 50 litres per day of freshly filtered water, our stainless steel gravity filter comes complete with two Sugalite cartridges and requires no plumbing. It is capable of removing 99.99% of all particles larger than 1 micron including dirt, rust, sediment, bacteria and parasites. In addition to pathogenic bacteria, the Sugalite removes organic pollutants, such as agricultural pesticides and herbicides, chlorine, and dissolved heavy metals, such as cadmium, lead, mercury and copper. A gravity filter will also improve the taste of your drinking water and remove odours. What contaminents will the standard Sugalite filter not remove? The Sugalite filter is not configured to filter Fluoride or Nitrates. 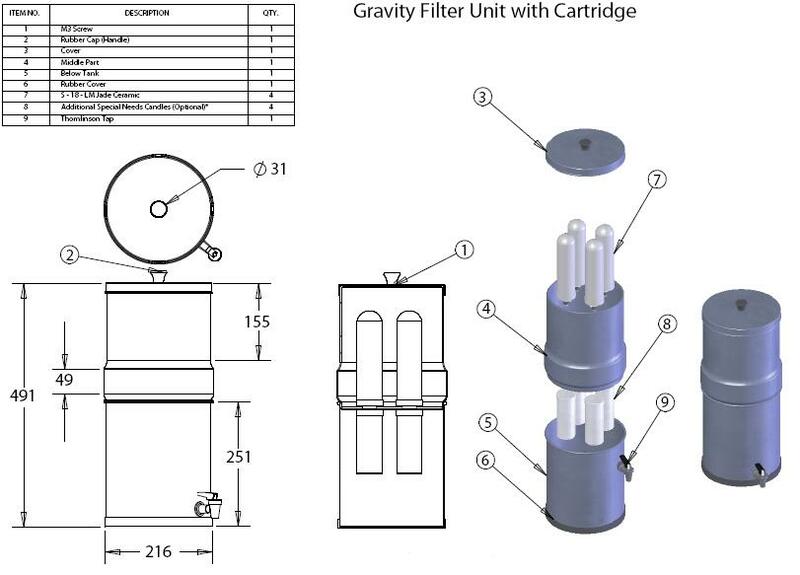 It possible to purchase the Fresh Water Gravity filter with either additional Fluoride or Nitrate filters, although these may not be necessary for most people. Fluoride is added to the water supply by some UK water boards but not all, so we would adivse you contact your local water board who will tell you if fluoride is added. Nitrates are only generally a concern for those with private water supplies. To add the additional Fluoride or Nitrate filters to the system simply click on the 'Select Option' drop down box above.